Includes axe and shovel mount. Includes wind deflector. True 4 ft wide capacity. Designed to carry full sized 4 x 8 steel plates or plywood. Mounts to the stock P38 slide open rack mounts. Multiple cross bars are re-moveable and interchangeable to allow for different configurations including sunroof access or sunroof protection. Powder coated finish. SHIPS FREE TO ANYWHERE IN THE CONTINENTAL USA (Shipping to: OUTSIDE USA? Contact us first for a shipping quote). Ships unassembled. All hardware is included. Simple tools and some assembly required. This was specifically designed to fit a 1997 P38 although it fits a variety of model years. Proper fitment will be the responsibility of the buyer. Contact me if you have questions. Made in the USA. California residents add tax. Items are made-to-order. Allow 2 weeks for production. 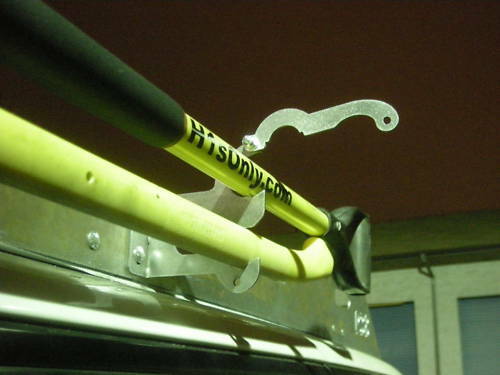 Land Rover P38 Range Rover Roof Rack. Semi Gloss Black. $1199.00 includes shipping within the USA. California residents add tax. Items are made-to-order. Allow 2 weeks for production.